Chelsea Handler and Tomi Lahren go head-to-head. The Comic-Con of politics attracted more than 10,000 people over the weekend to the Pasadena Civic Center in sunny, southern California. Politics met entertainment at Politicon, a bi-partisan unconventional political convention that brings Republicans, Democrats, and people of all political stripes together annually. Headliners included Chelsea Handler, Tomi Lahren, America Ferrera, Rob Reiner, Joy Reid, Jake Tapper, Ann Coulter and gaggle of more political pundits, newsmakers, comedians, actors and Capitol Hill strategists that talked affairs of the state in dozens of panels and workshops. Panelists went head-to-head on a wide range of topics during the two-day political festival. Talks and debates that ranged from calm to emotional centered on subjects such as Russia’s attack on our democracy, Trump’s sanity, Trump’s battle with the media, the LGBTQ community, controversial speakers being muted on college campuses, Obama’s legacy and more. Coulter, a hardline conservative, was quick to say that all protesters are liberals who trash things and break Starbucks windows, while Proops had a different opinion. “The idea that the only protesters in the streets breaking things up are liberal protesters is also fallacious,” he said. Even though California is predominately a democratic state, the convention rooms seemed to be filled with an even number of liberals and conservatives. Due to acclamations and catcalls coming from the audience, some of the sessions resembled a wrestling or UFC match. 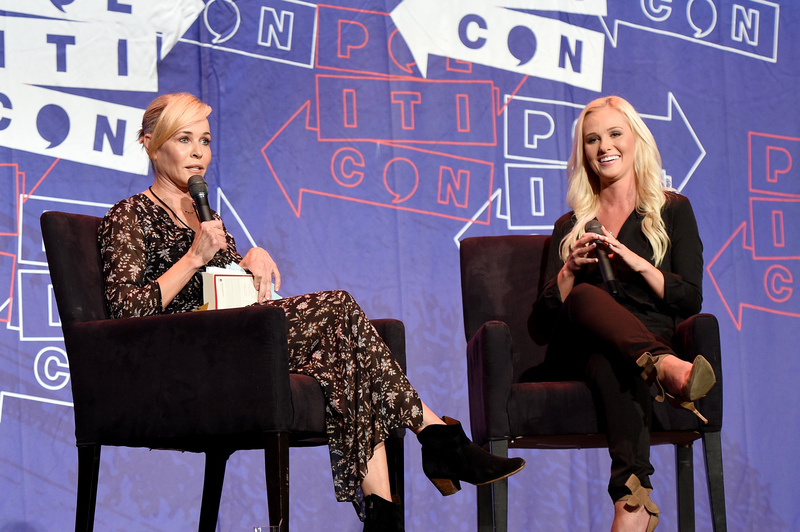 During Chelsea Handler’s exchange with Tomi Lahren, the audience continuously heckled or cheered prompting Handler to stop the conversation. Handler and Lahren discussed health care. Handler views health care as a basic human right. Lahren, a critic of the Affordable Care Act, who does not want to pay for other peoples insurance, admitted to being on her parents plan under the ACA. The ACA, otherwise known as Obamacare, covers dependents under their parents’ health insurance until the age of 26. Young adults can remain on their parents plan even if they are married, attending school, not living with their parents or eligible to enroll in their employer’s plan. Elsewhere at the convention, director Rob Reiner and Atlantic senior editor David Frum, discussed Russia’s cyberattack on the U.S.’s democracy last year. Reiner and Frum represent opposite sides of the country and disagree on numerous domestic issues, yet agree on the urgency of addressing and dealing with Russia’s interference in the presidential election. Frum said the Russians used tools such as money, propaganda, false stories, and narratives to affect the election’s outcome and help Trump become America’s 45th Commander in Chief. “What I don’t know is the extent the Trump camp coordinated with the Russians,” he said. Reiner echoed Frum’s concerns and added there was a glimmer of hope the Republicans would come together to address the hacking. Reiner was referring to a bill the senate approved 98 to 2, which decrees the president cannot lift any sanctions on Russia without the approval of congress. Frum and Reiner sent a clear message to the U.S. Senate and the Trump Administration; deal with the Russian hacking in order to avoid future catastrophes.